Of all the treasures we can collect in our lifetimes, memories are the most precious. I am off to collect more of them, to hold close to my heart to be savoured at leisure. I will be laughing, playing and running with the little one – yes, running too. With due apologies to Mitch Albom,** ‘The running girl is inside every woman no matter how old she gets,’ — especially when her granddaughter is with her! I know I promised to share the moments I savoured with my little granddaughter, but I am afraid I am unable to sort them out in any kind of order. So please bear with me as they jostle in my brain, each trying to get out in print faster than the other. Some simply refuse to come out through my fingertips. Hope you understand…. ‘Are you going to stay here for a hundred years?’ I am asked the day after we reach London. The little head nods vigorously, the ponytails on her adorable head bobbing up and down as she nods. One day her mother tells her sotto voce, ‘Paati’s birthday is the day after tomorrow,’ and the little one comes running to me. ‘Paati, I am going to make something for you for your birthday. You should not look at what I am doing. You will get it ONLY on your birthday, ok?’ I am banished from the living room as she busies herself with her crayons and other paraphernalia. For the next couple of days she is excited about the gift she is making for me and asks me a million times if I have seen it. I reply truthfully that I haven’t. On the big day, the first thing she does after waking up is to run to the hiding place of the gift and presents it to me with a flourish. 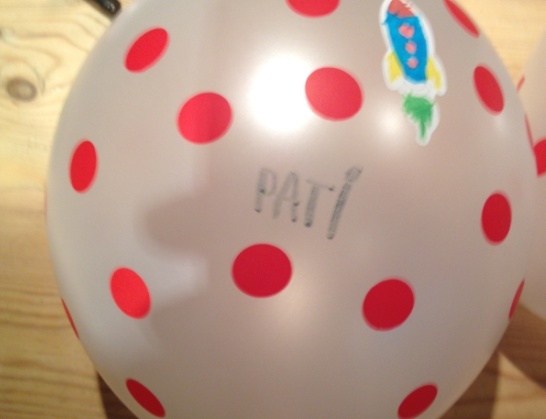 ‘Hapy BirThday Pati’, the painstakingly made card, with its glitter and stickers says. It is embellished with a lot of hearts, crosses and circles. She explains that the crosses are kisses and the circles are hugs, as she gives me real ones. I am reminded of the same time last year, when she had declared me to be ten years old. That number had been the highest in her little world back then. In one year, it has gone up to a hundred. My reply of course doesn’t interest her since the numbers between one and hundred don’t mean a thing to her – just the beginning and the end do. I can’t but marvel at the simplicity of it all. How wonderful to have a limit to something! We could indeed learn a thing or two from kids, whose thought processes are simple and uncluttered. 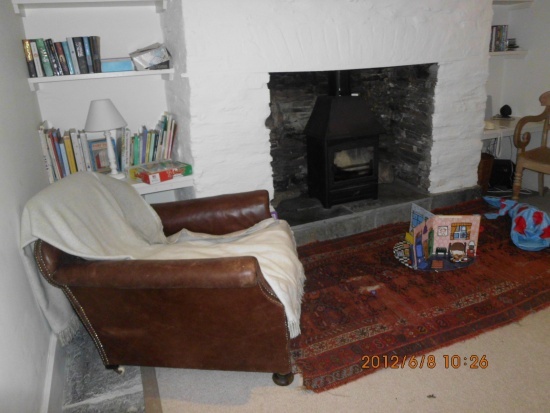 In the farmhouse where we stayed during our holiday in Cornwall, there was an armchair by the fireplace in the study. On the first day there, she was so excited that she dragged me in and made me sit on it. The chair where all grandmas sit and speak grandma. ‘Paati, where are your glasses?’ she asked me. I had to dig them out of my handbag and wear them because, ‘all grandmas wear glasses and sit in that chair.’ Once the glasses and I were in place, she bade me speak ‘grandma.’ I wondered how I should do that, and she told me patiently that it is what all grandmas speak. The poor little thing didn’t know that this grandma knew no such thing and what was more, was as goofy as they come! When it comes to games, she has her preferences. With her thatha, it is the rough and tumble ones which involve physical exercise. But with me, she just wants to play milder ones like hide and seek and other stay-put-in-a-place activities. This involved searching for her toys which were ‘hidden’ by her in the room or drawing pictures on demand, or finger-men walking on her back as she lay face down. The best thing about the hiding game was that she would give me ‘clues’ about where to find them, which were infinitely sweet and ‘awww-inspiring’. ‘There is something hiding behind that curtain,’ she would say. Or, ‘Maybe you should look under the table,’ she would offer, as she hovered anxiously around till I found them, not realising (or did she?) that she had told me the hiding places. But she wouldn’t want any clue when she did the seeking. I found it too endearing in a four-year-old, who saw herself as more capable in comparison to her old and doddering paati! What else do I share with you all? Her unique language Marhini, which she makes up and speaks fluently and expects you to speak too? You make up some gobbledygook but she is sharp enough to detect any variant syllable, tone and inflection in the ‘language’ and informs you accusingly, ‘You are speaking some other language and I don’t understand it.’ She does it with such panache that you begin wondering if it indeed is a real language! …or do I tell you about her imaginary friend Poppy, who ‘comes all the way from Africa in a car that can fly’, across the seas to her home in London. I never ceased to marvel at her wonderful imagination as she created various scenario around her. Poppy has a little brother who is called Zima and who sits on Poppy’s lap as she swings in the backyard. ‘Pati, push slowly. Zima is little and will get scared,’ she would instruct me. Or at another time: ‘Shhh….Zima is sleeping. Don’t make any noise,’ she would whisper. Once when we were on our way to the castle at St.Michael’s Mount in Cornwall, she was suddenly disconsolate. ‘We have forgotten Poppy. She is alone in the house!’ she cried. Till her mother picked up her phone and ‘called’ Poppy and asked her to take a taxi and come right along to the castle parking lot. …and how she found ‘treasures’ in the castle there. She brandished the map that we picked up at the ticket counter and informed us that it said there were seven treasures hidden there and she had to find them all. Her father played along and left a coin ‘treasure’ in nooks and crannies as we pretended to search for them and helped her ‘find’ them. Boy, was she happy to find all the seven treasures! Back in India, they stayed for less than a fortnight and given the heat here, it was just as well. But the time sped past too quickly and I was not able to enjoy her company fully since I was pretty unwell for some time. Don’t they say that too much of a good thing can be bad for you? Maybe that adage was at work. From the time she got up everyday, it was a countdown to 6 PM, when her thatha took her to the playground and for the rides in the mall near our house. One day, she bought me a huge balloon as a get-well present! During the day, she would periodically rush to my side and give me a quick hug and kiss before running out. Another day, when she went to the temple with her thatha and mother, she brought back the rose petals given there as a prasadam for her paati, holding them all the way in her little hand and thrusting them at me the moment I opened the door. The squished flowers smelt sweet and I put them inside my clothes cupboard, to sweeten the dresses with their fragrance and love. This is a fragrance that doesn’t fade with time but lingers on an on as I curl up with the memories and feeling her softness next to me…. ** ‘The running boy is inside every man no matter how old he gets’ – Mitch Albom in The Five People you meet in Heaven. This was simply beautiful Zephyr !! I loved your narration , the love, the bonding with your sweet little grand daughter. And i truly loved Poppy. It reminded me of Hobbes and how Calvin once misses him when he was left behind. Children’s make believe friends are as real as they can get ! Thanks Asha. What would we have all done as children if we didn’t have our own imaginary friends? But it takes patience and understanding to play along and make them feel good about their friends, imaginary or not, right? Wow! Thanks zephyr for sharing some Marvellous moments! Good to see you after a long time.Sorry for the delay in replying. Lovely post Zephyr.I loved reading the cute anecdotes. Grandchildren occupy a special place in our heart.Isn’t it a torture to live away from them? I guess we value the time together more when we live apart but just a few weeks a year is sometimes a little too little, isn’t it? I remember reading this post vividly, sometime back! Never got bored of reading again! Grand children are always precious. You must have treasured the card too! I have, Sandhya, saved the card, that is! She has now begun writing letter! Loved the ‘speak grandma’ part Zephyr. This post has made me impatient to be a grandma. Unfortunately my daughter has dug her heels in and refuses to get married for at least 5-6 yrs more. Sigh! It is heartening to see that her imagination was not curtailed and was allowed a free rein. Even more, that her mom played along with her. Thats truly remarkable. I doubt if i would have done the same. Foolishly I’d have tried to ensconse my child in reality… that magicless aridity. And I’d have been so wrong! Do you know, you facilitate insight even without trying… you teach even without knowing? Awwwwwwwwwww!! That’s so adorable, Zephyr! And your granddaughter is so sweet and funny. 😀 I don’t remember a lot from when I was little, but I do recall certain memories with my grandparents. Like being tickled by Pepere Letourneau, or watching TV with Memere Letourneau, or walking with my maternal grandfather as he held my hand and showed me his chickens, pigs, and other animals he kept. We all have our own bags of treasures, and it’s good to open the drawstrings now and then and sift through the contents. 🙂 Thanks for sharing these gems with us! Heart-warming post, Zephyr! What a wonderful relationship between Grandmother and granddaughter! A cherished relationship indeed, Manju! sweet and lovely post, full of precious memories. Diya is so lucky to have pati like you. Reminded me how I spent time with my grandpa. Few more hours and Diya will be with you have nice and great time . Oh yes, Suman. It is just over a day for them to land and then it is going to be a blur before they leave! Hope the weather holds out and doesn’t rain too much. What a lovely, lovely writeup this is Zephyr! Anyone, including a Martian, would want to be a grandmother after reading this one 🙂 The softness and beauty of those tender moments, full of love and warmth and cuddles and kisses, is so wonderfully expressed in your words. I could just feel how you ‘full of love’ you must be feeling while penning down these precious memories. That love-filled-heart has out-poured itself in this post. Thank you for giving us a peek of these beautiful memories. In awe of the wonderful imagination of your little one. Her care and concern for Poppy and Zima is so touching. Loved reading that part. Also loved the part about the lessons to be learned from the uncluttered thought-process of children. That’s so true, really. We adults miss out on so much because we think (or pretend to think) on complex things in complicated ways! Wishing you many many more of such wonderful moments in the coming days/weeks. Thank you Beloo. Yes, I will be jealously collecting and hoarding the memories! In the three years since this post was written,her imagination and creativity have grown by leaps and bounds. I think she now knows that her grandma can’t speak any ‘grandma’ 🙂 When we ask her about Poppy and Zima she looks surprised and asks, ‘Do you remember them?’ Her memory is astonishing too. What is gratifying is that her mother never told her not to play with pretend friends and played along admirably when required as when she held the conversation with Poppy. This was written when she was four, Varsha. Now she is a little lady waiting to wow us all 🙂 If our Skype conversations and activities are any indication, I will be super busy with her in person! Kids do that to you, don’t they? Indeed a bagful of lovely memories! Your lovely memories with Diya made my heart swell with happiness. I was smiling fondly all through the post reading all the cute little things both of you did. They brought out the child in me. My entire childhood streamed in front of my eyes and it made me nostalgic. You are such a wonderful grandmother and Diya is simply adorable. Reading this post reminds me again how beautiful life is and how simple pleasures fill our heart with bliss. Such precious memories! And I am fortunate to have a glimpse of these golden moments through your heart and your words. Thank you. Delightful remniscences of a loving grandma. I enjoyed reading it all, as I am also blessed with two grand daughters thru my eldest daughter and two grand sons thru my second daughter. Children are children where ever they are and I look lovingly at young kids, even, if they are total strangers. Their childish pranks and innocent observations, captivate one’s heart. What then, one feels, when they happen to be your own grand children, words cannot describe. My second daughter was here for a month from Canada and all of us made a trip to Bangalore where my eldest daughter lives. What a pleasurable experience it was, words cannot describe. Only, they very much missed their dearest grandma (my wife), who passed away suddenly in March, 2011. More than me, I felt, they seem to miss her, as she used to play just like children with them and prepare rare delicacies, which they relish and pester their mothers, saying, what they prepare is not as good as their grandma”s preparations. You have brought back to surface in my mind’s eye so beautifully in your own inimitable way, similar anecdotes, which I enjoyed reading aggin and again. The pleasurable experiences will linger till I breathe my last. Thanks for sharing. What a beautiful bag of memories you have there. Lovely hearing about the little one and the games she made you play. I am sure with your story telling skills, you gave her something of the stereotypical grandma – regaled her with stories! She must miss you as much as you do her. I hope you videoconference often with her! It certainly makes the distance go down by many thousand miles! Stereotyping has not spared even grandmas. Sorry cannot bring myself to protest for this one. There is a certain warmth with this stereotyping and association that brings comfort more than regression to one’s mind. I appreciate the fact that none of you is brushing it away but indulging her thought process. Not all families can do that unanimously. My DIL is still in touch with the child in her and so understands these sentiments very well. You should have heard her talk to Poppy that day. We were all hiding our smiles as the little one anxiously waited for her friend to come 🙂 There are so many more memories and I am still recording them all in print so that they will remain fresh for her to read and smile when she is older. Your pethi is a lucky to have somebody like you as grandmom..and yeah the gifts,touched my heart.I remember,when I was a kid, I did put in lots of efforts to draw or make something and make it look like a gift. I remember the post you had done on hand made gifts — lovely ones they were. No wonder they touched your heart 🙂 My pic on the blog? No ma’am! Of course I do! My DIL and Diya are great ones for selecting gifts and personalising them too. Did you see my name on the balloon I got? Beautiful. There are few things more sublime than the relationship between a child and his/her grandma. Glad to hear that you had a great time. Welcome back. We’ve missed you. Nicely captured. The world of children is indeed nostalgic – either one’s own childhood in my generation and one’s children’s childhood for the next generation. 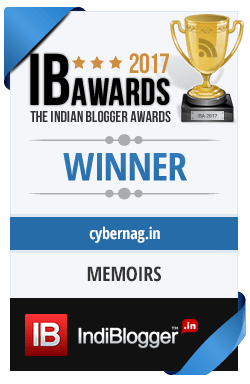 I thoroughly enjoyed reading and re-reading your blogpost. It gave me a beautiful feeling that Farheena is just a small child, as she does many of the things like creating own language, having an imaginary friend like your little princess. Only difference is Farheena is 17 now :). BTW the stone castle looks so much like a Ninja Turtle to me.. I am in love with your grandkid. Tears, tears, tears! !..such a beautiful written piece..and what a darling of a lil girl you have! !..i loved her rock castle, her care for her imaginary friends, her care for you..what a gentle, kind and warm soul this lil angel is! !..god bless her always..
🙂 children build such castles in their heads. So intriguing and so innocent. None of us could explain, till he finally said, “maybe he was not strong enough”. Hey Priyanka, good to see you here after a long time! Haha.. Yes. I’ve been away, over working myself, not doing things that I actually enjoy. 🙂 I’m back! How old is your grand daughter? She must be a bundle of joy, love to her. 🙂 No.. I’m still working equally hard, but i’m making time for stuff that i love doing as well. I’m done being a workaholic. It was a very pleasant ride with you through your memories and the little angel seems to be such a cute darling…Loved the part about leaving her imaginary friend back and having had to call her…My mother is starting back to India tomorrow after spending a couple of months with my little brat…Being a grandmother is a joy only other grandmothers can relate to I suppose 🙂 Lovely Post! Thank you Jaishree. Yeah, only grandmothers can actually understand the joy and pride of being with grandchildren but it also helps the grandchildren to hark back to their own childhood spent with theirs. She is adorable and I have been the Lucky one to have actually MET her too. You had a good time here in UK, see see you shud have stayed with us , you went to india and fell sick..
beautiful post , reminded me of the lovely time and beautiful days I had with my grandparents .. Lucky are the ones who have enjoyed that ..
You are right, lucky are the kids who are able to enjoy the company of their grandparents and vice versa especially in today’s world of distances. And next time I will most certainly stay with you. Thank you so much for inviting me 🙂 I am doing good now, thanks for asking, Bikram! What a joyful post! Lovely read 🙂 When she grows up, she would definitely come back to read this over and over – to stay connected with her innocence. She is very lucky to have you, just as much as you are to have her. And this one speaks of it. Thank you Ghazala. I am sorry you couldn’t spend much time with your grandparents. Sometimes things happen over which we have no control. Oh Panchali, sabr karo. We don’t want to push our kids do we? 😀 It is the little one whose heart is large. She has to share everything and loved giving gifts — handmade cards embellished with trinkets and phonetically written out messages are her forte. Zephyr patti,(from now on i am going to call u by this name) belated b’day wishes.. glad that u had good time with ur granddaughter.. ur granddaughter is really cute.. she wants u to celebrate 100th b’day.. :)..she has a great attitude.. hope it continues till end..
Don’t worry, children make their memories and give the old folk theirs. Let her get a little older. Glad you could enjoy some beautiful moments with your grand-daughter. That brought a wide smile on my face. Aww…..that’s such a sweet post ! No doubt the memories of the time spent with your granddaughter will fill your days for a long time(read till you are together again) ! My boys too spent some previous time with their grandparents as kids(when in US) and their bond and attachment with their ‘ajji’ is strong as ever ! Glad you liked the post Amit 🙂 Did your own grandparents come to mind? ..yes they did, but unfortunately I lost them young. You are right. Most children shy away from ill people. That’s actually very endearing about her. The make believe world of a child that feels more real than ours. Makes you wonder if the child in you is still alive! And it’s a pleasure reading about the rare bond she shares with her amazing Paati. Lovely post again aunty! Just got to spend a few hours with her but they made my day…the way she speaks and the things she says at her age is uber cute!! Felt like just squeezing her up when she said some things but was scared she would become conscious and stop talking! :D.. Thanks for sharing all these tiny things.. I can totally imagine them..bought a smile to my face! I was nodding all the time I was reading this. And it took me back to similar times when my son was little. Actually mothers and fathers kind of become irrelevant with the grandfolks are around. Both the grandmas in my family used to refer to my children as “tonics” ; you magically recovered from anything when the “tonics” arrived ! Lovely lovely post and would love to meet the little lady one day ! Thank you Suranga. They are tonic indeed! When I was laid low with a migraine last week, she had obviously been told to keep away from my room, but she somehow managed to sneak in. ‘Paati’, she whispered, pressing her cheek to mine and giving me a hug before running out surreptitiously! Believe it or not, my vomitting stopped after that 🙂 What I admire about her is her wisdom and compassion. Hope you get to meet her too! Such a cute post! Had a smile all through!!! Gentle and innocent!! Grandparents and grandchildren have such a unique relationship – and I’m glad that you were able to gather a storehouse of precious memories on this trip, Zephyr. The little lady must be truly treasuring her time with you all. I remember my Mum having a bad case of ‘flu a few Christmases ago. She could barely sit up in bed. But as soon as her grandson came to visit she perked up and started reading him a story! That’s the magic of grandchildren, I guess. Reminded me of the time I spent with my sis-in-law’s kids this year. They have such a beautiful world of their own that sometimes it makes me sad that they will grow up one day. How lovely 🙂 i miss my own grandma so much… we had such a close bond! I can understand how you must be feeling. But I am sure you have a store of memories too. Do note them down, won’t you? My nani… she was so kind and gentle… we would visit her during our summer vacations and she lived with us for the last few years of her life… she was such a joy… a wonderful friend, confidante, never judged or criticized… A fabulous cook, always ready to make anything we kids wanted… Very comforting presence, always welcomed us with open arms, and all her grandchildren adored her… she had such a quirky sense of humour… and she was such a regal person, commanded so much love and respect. I really miss her. I have so many pics of her in my room, she was always smiling. All grandmas and grandchildren bond well, whether they are paternal or maternal. I am a nanamma btw 🙂 I remember when my children were young, I would be surprised to hear tales of their smartness, creativity and a lot more — which I sometimes was not even aware of. So I can understand how you feel. And now it is my turn at being grandma 😀 Alas, the time with the little angel is over and she has now gone to her ammamma’s house to leave them with memories to cherish till we meet again! How sweet!! I don’t have good experiences with nanammas unfortunately. Whoever it is, grandmas are always special. And I am happy for you to have a wonderful grand daughter. Wow Mayank! You still reading me? I thought you had stopped. You must be seeing the bond at home, to come out with that comment, right? Circles and crosses as hugs and kisses……I am sure you would want to stay there for a hundred years. Your granddaughters innocence and your love for her came across so beautifully. Have a good time and forget all about the blog or reading other blogs while you are with your precious angel. Alas, a hundred years didn’t even translate into a hundred days 😦 But no matter, what I had can fuel me for another year when we meet again 🙂 She is the most warm-hearted and large hearted child I have ever seen and these are not the words of an indulgent paati, mind you! what a lovely post, zephyr!!! i could picture every moment so perfectly through your words…. Oh, my comment didn’t go through :(. I will try to rewrite it. Reading through your nostalgic experience takes me back to my childhood memories of my nana. Unfortunately, he was the only grandparent we were close to. But, his stories, the games of rummy he played with us, the stories of courts and criminal cases are still fresh in my mind. Just recently, my dad came over on a short stay, and he bonded beautifully with my younger son. Nana and nati would talk for hours, the adult listening and reacting in amusement to an excited child :). Gautam also has a lot of curiosity about age. He is trying to grow up fast so that he can catch up with mom. I told him you can be taller to me but never older :). He said first you told me that I cannot be older than bhaiya and now you say that I cannot be older to you. Then, what is the point of growing older? I knew he would have come up with something 😀 And he is so right, what is the point of growing up if you can’t become older than your mom or brother? These are such gems of experiences only a Pethi and Paati can go through. You have put it in your usual beautiful style , making it a thoroughly enjoyable reading . Thanks Zephyr, for giving us the feel of the world of Paati. Hope you are better now. Take care. Yes, And you record it so beautifully. It will remain with me for a long time. Ah! How true it is that the things that matter the most are the things that are most difficult to say since the very fact of putting them in words seems to diminish them! Yet, you have managed to portray the endearing incidents in words without losing the warmth of the love that infuses those incidents with Life. Thank you for making me feel happy as a child for these moments. Zephyr you are lucky to relive the childhood all over again away from the maddening world ! This post was a reflection of the true bond between the grandparents and children:) A rewarding read on a Sunday morning! i was smiling while reading the post! what a fabulous time you had!! Poppy and her brother Zima can visit India in their flying car. they won’t have any problem with the traffic here. someone spending hours and days to make a gift is by far the best gift on earth one can get!! belated birthday wishes Zephyr!! Whether 4 years or 18 years, the relationship between grandmothers and granddaughters is special indeed.